You heard my last confession, which was many months ago now. But I have been thinking of that moment since you passed away earlier this week. After that confession, I wanted to write you a letter. I wanted to say more. But I never did. So, Fr. Gordon, here is your letter. I missed you today. I missed seeing you in the seat next to your wife, and I missed seeing you at the back near one of the icons waiting to hear confessions. I mostly missed you at coffee hour, because you were the one who used to do announcements and prayers. You used to call up all the people with birthdays, saint days, or anniversaries and make sure they were honored. The priest that filled in for you today forgot to do that. It was a mere oversight, and I can forgive him for it, but last week my daughter had her saint day (Mary Magdalene) and you wouldn’t have forgotten her. At that most recent confession, it was a Sunday that I didn’t really want to be at church. I felt lost, sad, and angry over a variety of things. Some were about Orthodoxy. Most were about Christianity in general. I’d been in my season of doubt for some time already. I saw you at the back of the church, and no one was confessing. I didn’t want to confess, but something compelled me to walk back there. You didn’t chide me or judge me. You simply said, “Don’t give up.” You told me to keep coming to church, to keep trying. You told me my faith would come back. Then you prayed over me, blessed me, hugged me, and told me to go wash my face. My make-up was running everywhere. I can’t remember how long ago that was, Fr. Gordon, but I will never forget that moment. I have come so close to giving up. I have come so close to throwing it all away. Some days I don’t think God exists. Some days I don’t know if we really need to be saved. I wanted to write all this to you, Fr. Gordon, after that day, but for whatever reason, I didn’t. I had an experience recently that turned me on to spirituality again. I don’t know if I’m ready to talk about it yet, but it was an experience that showed me that God’s table is, perhaps, wider than I know. As part of this experience I met a Benedictine monk who wrote poems about music and prayer and mothers. But he also wrote poems about doubt, cynicism, and anger. It made me realize that even the most religious people don’t have certainty. I came away from my experience feeling a sense of longing. Perhaps I am longing for God, or meaning, or community. I am not sure what I long for. I am not sure where I fit or where I will land. But maybe I can still grasp some meaning from the Christian life, even if I can’t claim to believe every dogma anymore. I do wonder if heaven is real. I hope it is, because I want for my brother to be in a place of safety and light, and I want you to be there, too. Today I was at church after quite a few weeks away, and I looked at the icons throughout the service. 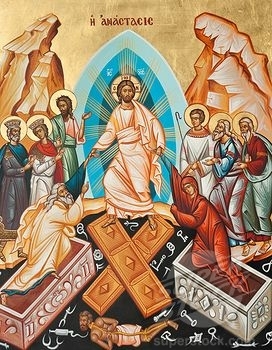 I particularly focused on the Resurrection icon, where Jesus literally stands on the back of Satan, the doors of Hell broken open at his feet. Surrounding the doors are a variety of locks, chains, and tools – all burst open and rendered useless. Theology aside, that icon is a symbol of freedom. The chains are off and the doors are open. The darkness is crushed and gentle hands lead me toward the light. Maybe we are all looking for freedom in some way or another. Freedom from suffering, freedom from pain, freedom from sin, freedom from perfection, freedom from materialism, freedom from poverty – physical or spiritual. Maybe we are all searching for the gift of feet that will stomp down doors for us and hands that will lovingly lead us out into the sun. I hope you have found it, Fr. Gordon. I hope that you found it in your life and that you find it in your death. Father Gordon Thomas Walker, priest emeritus at my church, lost his battle to cancer last week. Memory Eternal. Beautiful letter, Karissa. I’m sure Father Gordon loved reading it from Heaven and will continue to pray for you. Although I won’t be in Franklin for the funeral services I’ll be there in spirit tomorrow and Tuesday. Memory Eternal. Thank you for your honesty and for sharing a God-given moment in your life with us all. Father Gordon may have realized how much his words meant and continue to mean, although perhaps only now that he is in the eternal Divine Presence. I also appreciated your thoughts about freedom. It reminded my of St. Ignatius of Loyola. I realize he is not part of the Orthodox tradition, but freedom has a special place in his writings that I thought of when I read your words.